Story: i had seen him a few day before eating out of my trash but never let me get close. until the day in Halloween of ’10. i took him in, named him Bear(not after the wild animal or Bear Grylls), and doesn’t seem to be like most Siamese. he doesn’t like to be held, and is not very vocal. only when he wants to go out into the streets, then he gets very vocal. My Bear is a very relaxed cat, mainly he just wants to chill, sit and watch me play PS3, look out the window, then sits at the door letting me know he wants to go out. i’m a first time cat owner so i’m not all too bright when it come to cats so i’m always worrying of the little things i don’t know that cats did such as when they don’t stop sneezing until they clear their nostrils. the first time i saw it happen i thought something was wrong. aside from not knowing much about cat and my Siamese in particular, i found it was unique that Bear has 4 brown stripes running down from the middle of his head down to the base of his neck! and also has faint, but visible brown stripes stripes that run vertically down his stomach and horizontal stripes on his legs. maybe i’m just mistaking and faint stripes are common in Siamese cats. just shows how much i know. 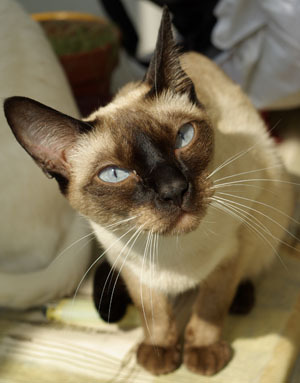 but i’m always learning new things about cats now and look forward to having another Siamese to keep me company. Bear has changed my life and now i cant see myself without one. Story: My friend found my little Kirby under the blackberry bushes at a storage facility. He was about 8 or 9 weeks old. He is adorable, long shiny red hair and long fluffy tail. He acquired a taste for marshmallows some time ago and he can catch them when I toss them to him. He is very playful. His favorite thing is when we chase each other up and down the hall and play peek a boo. He is about 1 1/2 yrs old now. My mom lives 200 miles away so I take Kirby with me when I go to visit. He doesn’t mind riding in the car, just sleeps in my lap all the way. He is my best little friend and companion.